VYM is one of the largest dividend ETFs in the market. The fund currently yields 3.10%, not incredibly high, but stronger than most of its peers. It is also a low-cost large-cap equity index fund; investors get broad equity exposure at a 0.06% expense ratio. I'll be taking a close look at the fund, its past performance, and comparing it to its peers in this article. The Vanguard High Dividend Yield ETF (VYM) is the second largest dividend ETF in the market. VYM is a large-cap equity index fund with a slight tilt towards higher-yield dividend stocks. The fund offers investors higher yields, lower capital appreciation, average total shareholder returns, and lower risk and volatility when compared to the broader equity market, and compares favorably to its peers in most relevant metrics. Lots of benefits, basically no drawbacks. I believe VYM to be a strong investment choice, and particularly well suited for dividend investors looking for broad equity exposure in one fund. VYM is administered by Vanguard, the second-largest asset manager and ETF provider in the world, and the company which almost single-handedly created and popularized low-cost index funds. I really like Vanguard as a company and as an index fund provider due to their unique company structure. Vanguard operates as a mutual company; it is owned by its own clients/investment funds, so any and all profits are ultimately returned to the company's clients in the form of lower fees. The structure makes for a sleepy, low-cost company, perfect for index funds. Index funds, including VYM, are perfect for slightly risk-averse investors looking to match the market's rate of return and willing to forgo the possibility of substantial capital appreciation. Broad-based equity index funds will never significantly under or overperform equity markets in general, as they are simply not structured to do that. VYM is no exception. VYM tracks the FTSE High Dividend Yield Index, a large-cap market-cap weighted stock market index tilted towards stocks paying higher-than-average dividend yields. The index first selects applicable stocks using only very basic liquidity, trading, country and voting rights filters. Stocks are then ranked according to their projected annual dividend yield, and included in the index until the cumulative market capitalization reaches 50% of the total market cap of applicable stocks. Simply put, the index includes the 50% highest-yielding dividend stocks in the market. Interested readers can take a look at the index factsheet here, and its methodology here and here, but I've covered the main points, few as they are. 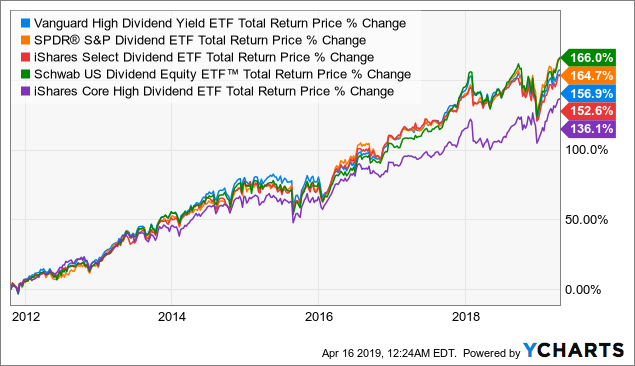 As the index's dividend filter is relatively weak, the fund only achieves a dividend yield of 3.1%, better than many similar funds, but not particularly high. The fund is obviously not ideal for investors looking for really high yields, but it has several other key benefits we shall soon see. I think it is obvious from the above that there really isn't any significant difference between VYM and SPY's shareholder performance, they almost always move completely in tandem, albeit some small short-term differences are common. Not a huge difference, but a higher yield is almost always better, and it does mean that VYM is somewhat more likely to overperform moving forward. 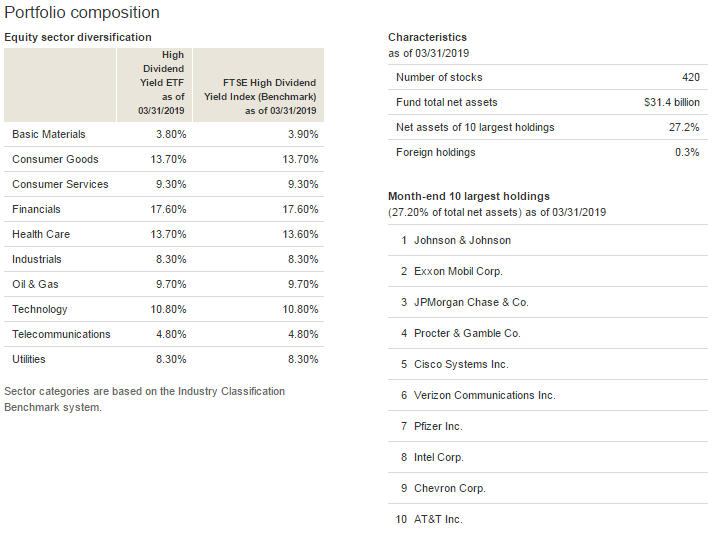 Taking into consideration VYM's underlying index, diversified holdings, widening yield, and long-term performance, I believe that the ETF will perform about as well, or even slightly overperform, the S&P 500 and other equity market indexes in the future. 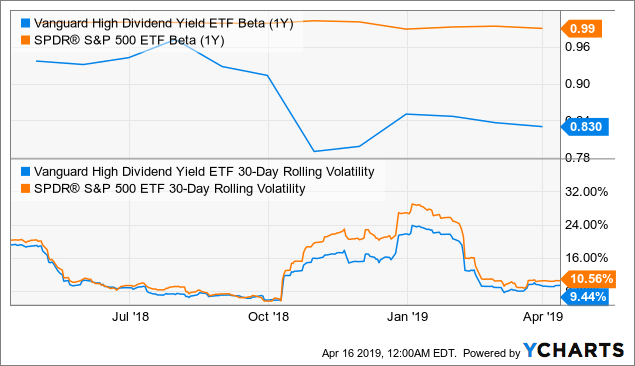 VYM's investors will receive slightly higher dividends, slightly lower capital appreciation, roughly equal total shareholder returns at lower risk and volatility than investors in broad-based equity index funds. I think this is a very strong value proposition. The way I see it, VYM offers a slightly higher yield and lower volatility than the S&P 500 and basically no drawbacks, sounds good to me! 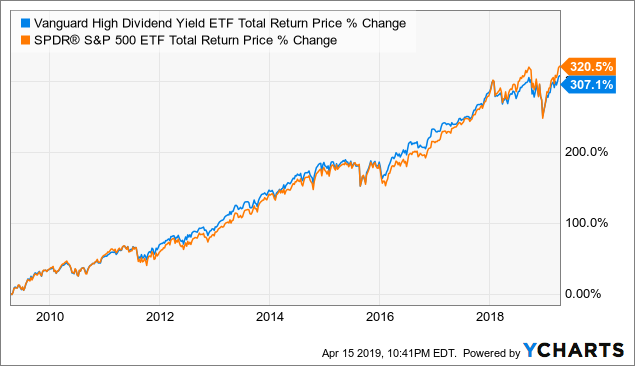 I've excluded the largest dividend-focused ETF, the Vanguard Dividend Appreciation ETF (NYSEARCA:VIG), as it is more of a dividend growth fund. I took a look at VYM's performance for different time frames, and the fund generally performs in the middle of the pack. 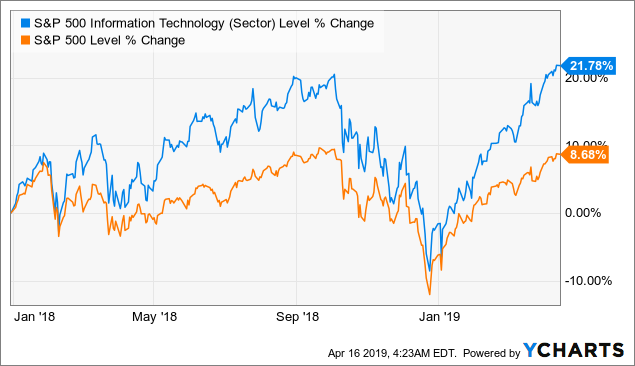 Although I couldn't find HDV's long-term financial performance, this particular ETF has lagged significantly behind all of its peers in the past few years, so I imagine it has underperformed during the past decade as well. Taking into consideration the points above, I believe that VYM's total shareholder performance has been better than average. DVY does offer a slightly higher yield, but an even greater expense ratio. HDV does offer a higher yield and comparable expense ratio, although total shareholder returns have been significantly lower than VYM's. Generally speaking, I believe that VYM is slightly better than all of its peers in most relevant metrics. Total shareholder returns have been somewhere between average and strongest, its yield is about average, and its expense ratio is below average. Many advantages, however small, and no disadvantages. As such, I believe that VYM is the comparatively stronger dividend ETF. Dividend investors looking for cheap broad equity exposure should consider including DVY in their portfolios. 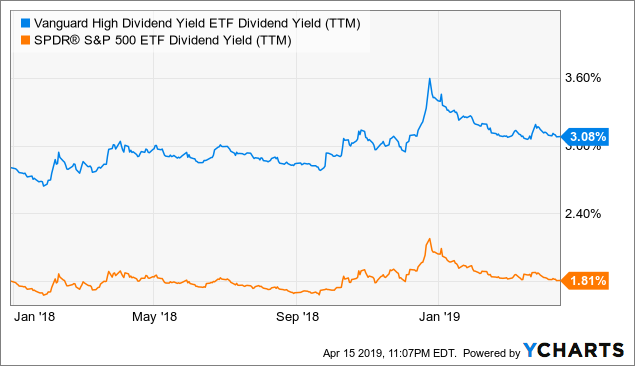 The fund offers a slightly higher dividend yield, lower risk, and roughly comparable total shareholder returns when compared to the broader equity market and its peers. It is a strong investment choice, and one without any significant drawbacks or disadvantages, and could easily form the core of any dividend investor's portfolio.